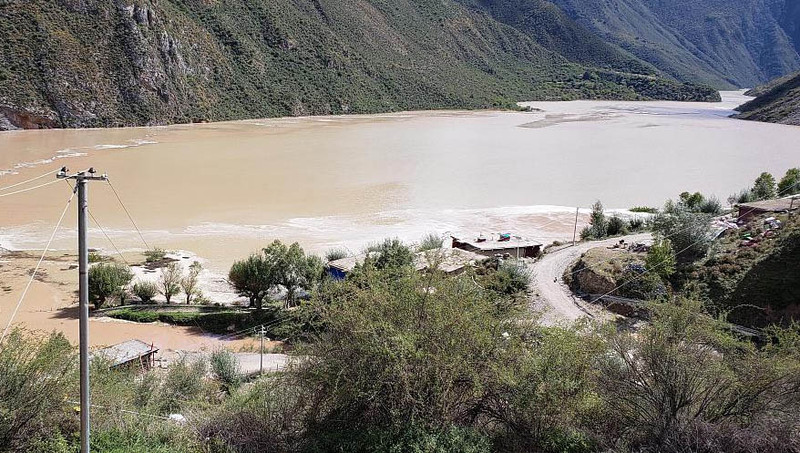 (TibetanReview.net, Oct13, 2018) – More than 24,600 residents of Tibet’s Chamdo (Chinese: Qamdo or Changdu) City and nearby Tibetan areas in Sichuan Province had been evacuated by 6pm Oct 12 due to fears of flood resulting from a barrier lake formed by a massive landslide which had blocked the Jinsha River, a tributary of the Yangtze River (Tibetan: Drichu). The landslide struck at about 7:10 am on Oct 11 in Bolo Township of Jomda County, Qamdo City, reported China’s official Xinhua news agency Oct 11-12, adding no casualties had been reported. Those evacuated included more than 13,600 from the affected areas and about 11,000 from Tibetan areas in neighbouring Sichuan Province, reported the official chinadaily.com.cn Oct 13. They were residents in 15 counties living within 300 kilometres (186 miles) downstream from the point of the blockage, the dailymail.co.uk Oct 12 cited the Chinese media, including China National Radio, as saying. Two villages have been submerged in the floodwaters brought by the barrier lake which was rising at a rate of about 60cm (two feet) an hour at the time of writing, the dailymail.co.uk cited Chinese media as saying. The reports cited Sichuan flood control and drought relief headquarters as saying the amount of water in the barrier lake – which measured 5,600 metres long, 200 metres wide and 70 metres deep – had reached about 100 million cubic metres as of 3pm Oct 11. Water overflowing the debris from the landslide was stated to bring immediate danger to an area of about 20 square kilometres (7.7 square miles). The China National Commission for Disaster Reduction and the Ministry of Emergency Management were stated to have jointly activated a level-IV emergency response, the lowest level, on Oct 12 at 3pm. The rescue team on the ground was stated to include 11 vehicles and 60 firefighters. Both the PLA and People Armed Police Force were reported to be taking part in the disaster relief operations. Xinhua said Bolo, in southern Jomda, is separated from Sichuan’s Baiyu (Tibetan: Palyul) County by the Jinsha River. It is stated to have an average altitude of 2,860 metres above mean sea level and to be home to 8,325 residents in eight villages, all of whom have been evacuated.